Ohio State University student fasters at the culmination of their seven-day fast in March 2017. Today we bring you the first of our four-part series diving deeper into the particular context of each of the “4 for Fair Food” Tour’s stops, beginning with the flagship school in the nationwide Boot the Braids campaign: The Ohio State University. After years of courageous student-led actions at OSU’s Columbus campus, including an historic seven-day fast by 19 students and community members, OSU students are fed up with President Michael Drake’s trail of broken promises. And they are not alone. Over the years, the students’ tireless efforts have garnered the support of countless people of faith and other consumers of conscience in the Columbus community as well as across the country, and they are joining forces this year in a coalition for action that promises a protest to remember! Before getting into the details of the upcoming 4 for Fair Food action at OSU, let’s turn back the clock and review a few of the critical milestones in the history of the Campaign for Fair Food at OSU. Three years later, in 2017, in spite of growing outrage over Wendy’s indefensible stance on farmworkers’ human rights, President Drake had taken no steps to end OSU’s relationship with Wendy’s. 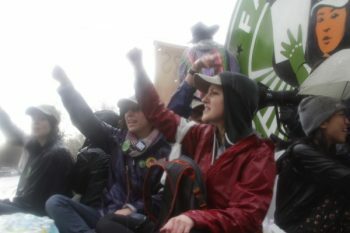 Frustrated by the lack of progress, in March of that year, 19 students at OSU as well as members of the Columbus community took the extraordinary step of launching a fast on campus for an entire week, refusing food and demanding that the University live up to its original promise to satisfy the concerns of the OSU Student/Farmworker Alliance. 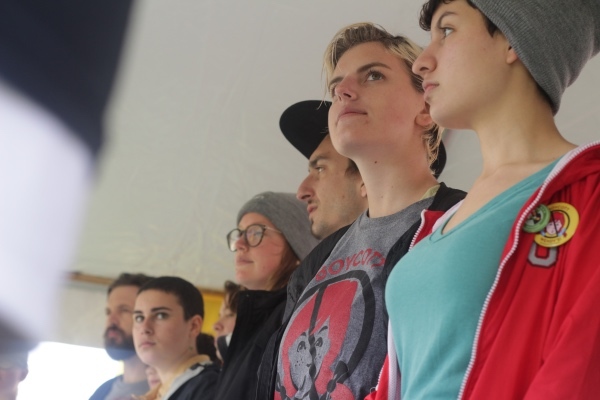 The deeply inspiring action, which culminated with the arrival of the CIW’s Return to Human Rights Tour to campus, sparked a rolling student fast in support of the Wendy’s Boycott across a dozen schools around the country, involving hundreds of young people. In May of 2017 – despite the singularly impressive efforts of OSU students and farmworkers to educate the university administration – President Drake and his administration made the unconscionable decision to renew OSU’s contract with Wendy’s… after students had left the campus on summer break. In spite of President Drake’s abject failure to demonstrate moral leadership, the Wendy’s Boycott has only grown stronger since 2017, both on OSU’s campus and across the country. And in June of 2018, Wendy’s bowed to two years of mounting consumer pressure, and announced that it would be pulling its purchases from farms in Mexico – where human rights abuses are as ubiquitous as they are well-documented – and instead shift its sourcing to greenhouses in the U.S. and Canada. However, Wendy’s again stopped short of joining the Fair Food Program, instead continuing to rely solely on its own corporate-controlled auditing schemes and public relations stunts to deflect criticism. … Twenty-five years ago, few observers in this country would have thought that what CIW and FFP have accomplished was conceivable, given centuries of oppressed farm labor in the U.S. — including over 200 years of slavery, a century of sharecropper exploitation, and decades of abusive conditions for the migrant workers who today comprise the bulk of the agricultural workforce. The FFP and CIW have secured basic… protections for tens of thousands of tomato pickers. But they have not achieved total success, and their campaigns continue in Florida and elsewhere. It is unfortunate that Wendy’s, virtually alone among major fast food brands in the U.S., has so far chosen not to join this effort. I hope that at Ohio State, administrators can listen to the students’ concerns and recognize the difference between a genuine and effective program preventing supply chain exploitation of workers and a set of expectations. [The OSU administration has demonstrated a] fear of alienating a corporate neighbor. Fear of taking a stand for fundamental human rights, despite the fact that more than a dozen corporations, dozens of universities, and tens of thousands of consumers had already blazed that path before OSU was faced with the decision. Even fear of their own students, causing administrators to put off the announcement until students were safely back at home and unable to react. So, while President Drake and his administration opt for business as usual with Wendy’s in Columbus, human rights violations will go on in the fields, and they will go unchecked. You can be as sure of that as you can of the sun coming up. And students at OSU will escalate their fight to cut the Wendy’s contract, and their fight will garner growing support from around the country. That, too, is guaranteed by this decision. All of which could have been avoided if President Drake and his administration had employed a bit more logic and principle, and chosen to support real human rights and dignity in the university’s supply chain. Instead, students, faculty, faith leaders, human rights experts, and farmworkers are left with no option but to prepare for the battle that lies ahead in Columbus. To make matters worse, the administration decided to permanently close the SCE office altogether in the wake of these revelations, directing students instead to other disparate offices around campus in the event of sexual assault – and a hotline that goes straight to voicemail. Predictably, the administration was barraged with angry letters from students, faculty and community members, demanding that OSU institute functional, respectful, and centralized services for survivors of sexual violence – not simply close down the failed center. When you compare these strong words – “Ohio State will do all that we can to be a national leader in preventing and responding to sexual misconduct,” and “Ohio State is committed to having the very best systems in place” – to President Drake’s actual record on sexual violence against farmworker women, the hypocrisy is rank. If anything, Ohio State has shown itself to be a national leader in turning a blind eye to the ugly reality of sexual violence in the fields by inexplicably insisting on doing business with the only major fast food company yet to join the Fair Food Program, a program described by PBS Frontline as “unique in the country” in its ability to prevent the epidemic of sexual violence in agriculture. And as to putting “the very best systems in place” to deal with sexual violence, Ohio State has opted to rely on a system — Wendy’s woefully inadequate and opaque in-house social responsibility scheme — that has been characterized as “little more than a sham” by one of the world’s foremost human rights experts, and former OSU law professor, James Brudney. In other words, President Drake is either trying to fool himself about the real world impact of his decisions on the lives of survivors of sexual violence, both in OSU’s supply chain and on its campus, or trying to fool the public about the kind of leader he wants to be. Regardless, the opportunity to play a true leadership role – and to protect OSU from the fallout when, as seems inevitable, headlines trumpet human rights abuses in Wendy’s supply chain – is still on the table. The administration could, and should, leverage its considerable purchasing power by being the first university to cut its contract with Wendy’s — as the University of Chicago was during the seminal Taco Bell boycott. That decision led more than two dozen other schools to follow suit, which collectively represented real market power — and a disastrous public relations trend among a key market demographic — that Taco Bell could not ignore. The University of Chicago sparked a chain reaction that played a significant role in bringing Taco Bell to the table and laid the foundation for all the unprecedented human rights gains that ultimately followed for tens of thousands of farmworkers thanks to the Fair Food Program. That is what being a “national leader” looks like. That is what it means to put principles into action. And that is the context at OSU as the “4 for Fair Food” Tour rolls into town on International Women’s Day next month. Register to join us on March 8th in Columbus, and make your voice heard in the growing call for fundamental human rights in our food system!